Groomsmen support us on the most important day of our lifetimes: our wedding day. If your groomsmen enjoy spending time on the golf course, the you can thank him for being a special person in your life by offering them the ultimate groomsmen golf gifts. Without a doubt, custom divot repair tools from Mark Mender are one of the best golf gifts for groomsmen. Equipped with many different features and seamless divot repair functionality, this golf tool is a definite win as the perfect gift for your groomsmen. Below we take a closer look at what makes the Mark Mender 4-in-1 divot tool to be considered as one of the best groomsmen golf gifts. Mark Mender 4-in-1 divot tool is a multipurpose product that seamlessly repairs divots in no time, and without harming the greens. 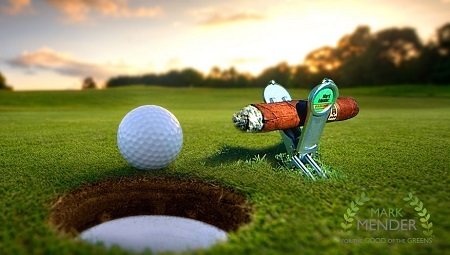 It also serves as a cigar holder, can be used as grip rest to help keep your golf dry, and comes equipped with a magnetic ball mark. With all these functions, the groomsman will definitely be happy to receive it. While making a purchase decision, you are free to select Mark Mender divot tool that is made from high tech aluminum alloy, space age polymer or zinc alloy. No matter the divot tool you select, you can be assured that it will serve the groomsman over an extended period since they are always designed to last and withstand everyday use. Moreover, you’ll have the opportunity to pick Mark Mender multi-purpose golf and divot tool that is designed with the groomsman favorite color option. Aluminum and Zinc Mark Mender divot tools are offered with your choice of silver or pink accents. Mark Mender 4-in-1 can be customized for special events including the perfect wedding gift for your trusted groomsmen. You simply need to contact the manufacturer and then they’ll design it to your perfection. The groomsman will definitely love the message you’ll suggest to be engraved on the Mark Mender multipurpose golf & divot tool. It’s obvious that the groomsman will be happy to receive a tool that gets the job done correctly and in no time. Mark Mender 4-in-1 golf and divot tool eliminates ugly ball marks faster and repairs them better than other pocket sized tools. With just a single squeeze the 2 sets of prongs surround the ball mark and then pull the turf together. You should note that the prongs grabs the grass vertically and doesn’t lift or tear their roots, which helps the green heal quickly. Mark Mender 4-in-1 comes in a small and pocket size design, which makes perfect for golfers who are always on the go. However, it clips to the users belt loop which will allow the groomsman to not only carry it anywhere, but also access it with ease. The original Mark Mender golf and divot tool is lighter compared to the one designed from Zinc alloy, which is a bit heavier, but more robust. You only have one chance to offer only the best and most memorable golf gifts for your groomsmen. Unlike any other golf and divot tool that you have ever seen, Mark Mender 4-in-1 divot tool can be a perfect groomsmen golf gift. The tool comes with top notch features and ergonomic design that any groomsman who enjoy golfing will love. It’s also offered at an affordable price and considering everything that it has to offer, you can be sure that’s its worth its price.